HomeMackinac Center Turns to Focus Groups: What Should We Have Said?? 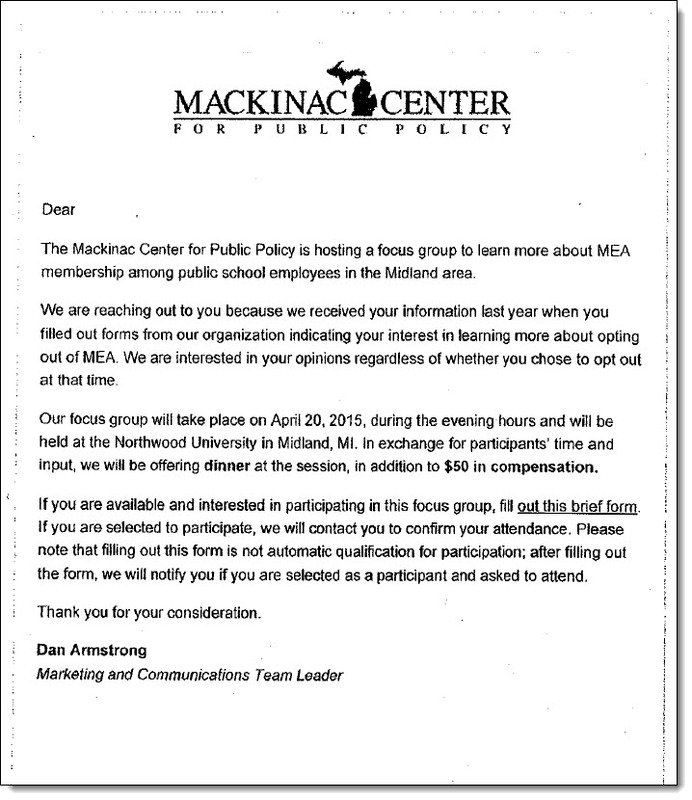 Mackinac Center Turns to Focus Groups: What Should We Have Said?? Much of what the Mackinac Center does is fortissimo, intentionally very loud. Continually boasting about their fight for liberty and calling each other patriots, or wailing about being victimized by this government or that union. Or when they want “union members to know their rights” the cover story for their unprecedented campaign last summer to convince people to quit their unions. But sometimes they operate much more quietly, like when they tried to scare off MEA members using push polls. Or when they need to do a little marketing research. A good example of the Center’s below-the-radar actions recently surfaced. It seems they wanted to find out what they should have said during the opt out campaign that would have changed more minds. Or what they said that put people off. As any halfway decent political organization knows, the thing to do in this situation is organize some focus groups. They collected the names of those who filled out the forms on the various opt out websites the Center created (to help “union members know their rights”), and compared those lists to names of people who actually quit the union. So if you decided to stay, we’ll give you $50 and a free dinner to tell us why. That way, next time, we won’t make the same mistake. Wow, I can’t wait until they start bribing my fellow autoworkers! It will be a cottage industry! This center is nothing more than a front for big business lobbies trying to eek away at middle class workers labor protections.. They are a pitiful joke..